A chain of mass M and length L is suspended vertically with it's lower end touching a scale (sa zicem un cantar). The chain is released and falls onto the scale. What is the reading of the scale when a length x of the chain has fallen? Neglect the size of the individual links. 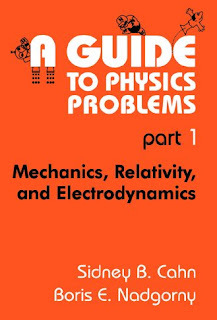 Aceasta e prima problema dintr-o minunata carte A Guide To Physics Problems. Cei interesati o pot gasi pe www.lookforbook.com . De prea mult timp nu am mai fost asa entuziasmat de o carte... cu probleme de fizica! P.S. Concurs: Care o rezolva primul?